The Samsung Galaxy Tab A 10.1 T510 is a new entry-level tablet that is also marketed as a family device. With a price tag of around 200 US Dollars, it is very inexpensive. However, it does feature decent hardware. That includes a 10.1-inch full HD screen, an Exynos octa-core processor, and a full metal body. Additionally, it is one of the first to run Android 9.0 Pie. Here is everything you should know about the Samsung Galaxy Tab A 10.1 2019. 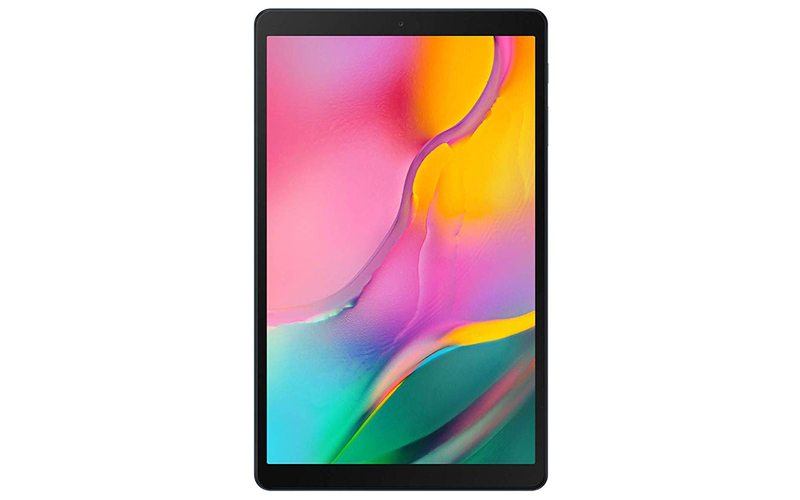 Even though the Samsung Galaxy Tab A 10.1 2019 is very inexpensive, it has an almost full plastic body. However, there is a small plastic part on the top for the antennas. It looks like a typical tablet from Samsung, has two speakers, a USB C 2.0 port, and a headphone jack. The cameras have a resolution of 8 and 5 megapixels. Samsung’s new entry-level tablet is 7.5mm thin and weighs 460g. The display of the Galaxy Tab A 10.1 has a diagonal of 10.1 inches and an aspect ratio of 16:10. While it is a TFT screen, we do get a full HD resolution with 1920 x 1200 pixels. Inside runs a Samsung Exynos 7904 octa-core processor with six 1.6GHz and two 1.8GHz cores. Additionally, we get 2GB of RAM and a 32GB internal storage. Yes, there is a microSD card slot to expand the storage too. Other features include WiFi ac, Bluetooth 4.0, GPS, and a 6150mAh battery. The Samsung Galaxy Tab A 10.1 2019 is one of the first tablets to ship with Android 9.0 Pie. On top of the newest version of Google’s operating system runs the One UI. That is the own custom interface from Samsung. One UI looks very similar to TouchWiz or the Samsung Experience UI. The interface looks almost identical to their smartphones. One new feature is Smart Things which allows you to control your smart home devices. The Samsung Galaxy Tab A 10.1 T510 started to ship in Europe on April 5th. Its price starts at 210 Euros for the WiFi-only version. However, you have to pay 270 Euros if you need 4G LTE built-in. As of writing this, Samsung did not mention if and when it will be released in the United States, Asia, or elsewhere in the world. A direct competitor is the Samsung Galaxy Tab A 10.5 which is about half a year younger. Even though their names are similar, they have different hardware. As the name suggests, the Galaxy Tab A 10.5 has a 10.5-inch screen. While it has a full plastic body only, it does have four instead of two speakers and 3GB of RAM. Very similar tablets are the Huawei MediaPad T5 and Lenovo Tab M10. Like with the Galaxy Tab A 10.1, those are missing premium features. However, they all have full HD screens, decent internal hardware, but are running Android 8. Among its higher-end competitors are the Huawei MediaPad M5 Lite 10 and Lenovo Tab P10. With those, we do get four speakers, a fingerprint scanner, and 3GB of RAM. Other aspects are very similar. The Samsung Galaxy Tab A 10.1 T510 2019 features a 10.1-inch full HD screen and an Exynos octa-core processor. Other features include 2GB of RAM, 32GB of internal storage, optional LTE, and a mostly metal body. It is shipping with Android 9.0 Pie.